This episode of Vikings gave a lot of information about a lot of characters in the series. I loved this episode even more as the last one although the dead is very present this episode. In this episode we see lots of change coming up. The first thing that pops into my mind is The wanderer Harbard what a performance if we look there is a no doubt about him that he is Odin. I will tell you why. If you look at wanderer there are four possible options. If you look at Harbard you will find out that it comes from Hackelberend. It is the name of Odin in disguise as wind-god but it could be another story a lover of Signy Harbard (Odin in disguise) who killed her brothers except for Sigmund. So the story about the giants and Thor he told the girls I wasn’t convinced yet I still had the idea that he would be Loki that is also a part that he killed his brother Otter also a myth by Sigurd or Thor because he could change to anything he liked and he was telling he was there and he asked who he where and the girls said Thor. Aslaug needs to know him because Sigmund is the father of Sigurd and Sigurd is the father of Aslaug. About faith and believe there is definitely a change in the ways the people believe in. Ragnar already believes in two gods. According to Floki Ragnar changed from gods already because it is Athelstan’s fault that Ragnar believes more in the Christian god. Floki thinks that it will make the gods upset. What we also see is that the nobles want to have the shipbuilding secrets because they gave away the secrets of farming. But King Eckbert has a larger interest he wants Mercia and for that he needs Ragnar and the pagans. Athelstan tries to convince King Eckbert, Princess Judith and the nobles to see what a ritual is the Viking way they agree but after the ritual the nobles want the pagans gone. The only mistake in the bathhouse our King Eckbert makes is that he thinks the Greek goddess is the same as the pagan one. We see a lot of battles, one battle is extra ordinary because this battle twist a lot of characters around. Ragnar, Floki, Bjorn and Rollo have to face the dead of one also loved character. But after last weeks end we already could expect who was going to die. What can I say about our brave men Thorsten. 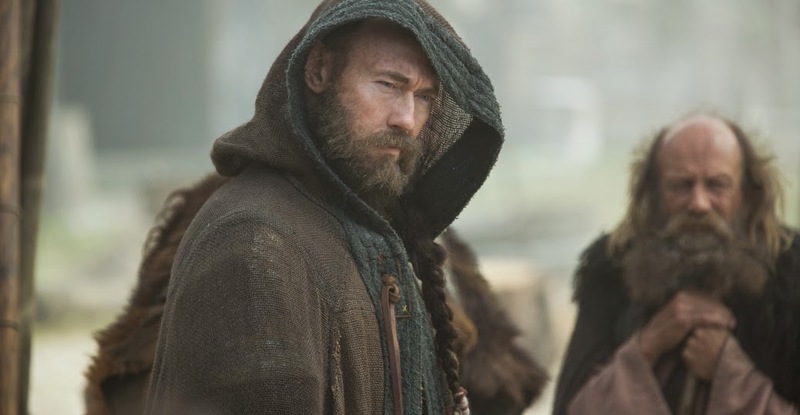 When he sees Rollo something happen between those two. Only at that moment he choose to take Rollo to make decisions that Thorsten already had in mind. He want to die in an epic battle. When he climbed that mountain he already knew he would be the first on top of the hill. Ragnar knows why he chose to go alone on that mountaintop. He want to die as a champion and he did. I sat on the edge of my couch and watched it with greatness. What a champion and what a great brave warrior Thorsten was the time. Also an alliance would be broken. In this epic battle we found out that Aethelwolf son of King Eckbert will betray the brother of Princess Kwindreth. I thought they made a deal in last episode and Aethelwolf wouldn’t fight along these pagans. Floki can’t except that he fight in a conflict that isn’t his it is Ragnar’s fault Thorsten is dead. But what happens next is more cruel than I expected from Ragnar. His own son needs him and what he does is tell him what he thinks about it. The part Rollo is playing in this situation is crucial. He gives Bjorn the real advice he needed.